Working on a global network, the Indian service sector contributes about 75% of the total world GDP. Parallel to other world economies, the sector not only brings large scale employment opportunities but also great investment sops for the country. Service sector organizations in India usually vary in sizes , on one hand there are huge entities including telecom, airlines, banks, IT companies, and insurance companies, while on the other hand, it adds all those who offer countless services at provisional levels like astrology, caterers, car cleaners, yoga instructors, interior designers, movers, and packers, etc. Even emerging as the brightest economic spot of the economy, the sector lacks and accumulates problems in terms of sustainability of work, lack of capital, effective promotion and accessibility of regulations. 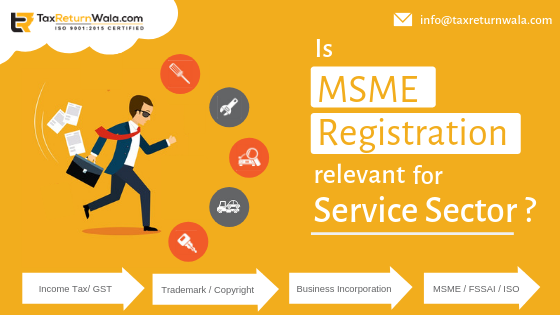 To scale up the growing service sector in India, the government has enabled MSME registration for all service entities. Individuals/entities engaged in the delivery of services can now register as an MSME and can opt for many additional benefits introduced by the government for MSMEs. In short, the major problems for service sector entities relate to the availability of credit, marketing support, cost of credit, productive and institutional framework development. The right of securing government tenders. Concessions in electricity charges, Stamp-duty, Excise, Octroi and other direct tax laws. Credit assistance from NSIC, SIDBI, and CGSTI. Support in Marketing, promotion of business and technological upgrades. Refund and exemption in statutory fees of filling trademark, ISO registration and other notified intellectual rights, etc. India’s distinctive approach and competitive advantage in services make it a unique emerging market in the world. Backed by initiatives of the government, the service sector alone has the potential to unlock a symbiotic growth for all nations. Inclusive of more and more infrastructure based incentives, as MSMEs, the sector has hooked up manifold in terms of output. Ensure compliance of your business with all major tax laws and regulatory requirements of government. Get yourself a virtual tax assistant for managing all your personal and business financial worries.